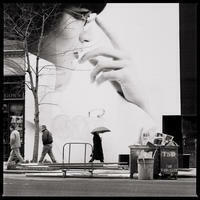 "Wouter Deruytter exhibits his large b+w photos of the billboards of New York at the Wessel + O'Connor Gallery . The series details the relationship between the passersby and their desires as projected in hypsersize by Madison Avenue. Online gallery."